Our search for Raymonda has taken us along way back in time and on the way we have found that most of the leading characters in the ballet actually existed in real life. We have met the real Jean de Brienne and his fellow Crusader King Andrew II of Hungary, and we have identified Sibylla de Lusignan, sister-in-law of Jean de Brienne, as the most likely candidate for Raymonda’s aunt the Countess and Canoness Sybil. We discovered that Bernard de Ventadour was the star troubadour of medieval times, but he lived and died before the time of our ballet, and came across three real troubadours who were alive at the time and who Pashkova could taken as the name for Berganger of Aquitaine: Berenguier de Poivert, Berenguier de Pozrenger, and Berengier Trobel. As for Abderrahman, between battles there were numerous meetings between the Muslim leaders and the Crusader knights to negotiate truces and arrange other deals, but these all took place in the Holy Lands, not in the south of France, enemy territory where a Saracen knight and his entourage would have been most unwelcome. So, we must conclude that Adberrahman only got into the story because the story needed a bad guy versus the good guy, Jean de Brienne, and that it was decided to make him Saracen to allow Petipa to spice up the entertainment with some colourful Arabian and Andalusian divertissements. But nowhere have we found Raymonda. Search through the lineage of the great families in the 13th century and you will find over and over again the names Sybilla, Isabella, Maria, Blanche, Agnes, Alice, Adele, Eleanor and many, many others – but never a Raymonda. So where is she? The answer has been staring us in the face all the time. Raymonda was the daughter of Raymond VI Count of Toulouse, named Raymonde after her father. She is the one and only Raymonde in the history of the 13th century noble houses, but she was lost in translation when Countess Lidiya Alexandrova Pashkova feminized the name in Russian by changing the last letter e to a! The Histoire Générale de Languedoc, Tome V, reports “un ancien monument” which records that Raymond VI Comte de Toulouse had a daughter named Raymonde. She is named and her parentage referred to by Roquebert. To understand what a brilliant match Raymonda would have been for the ambitious Jean de Brienne, let’s see what we know about her family. They were the Saint-Gilles, one of the most powerful families in Europe in the early Middle Ages. As the Counts of Toulouse they held vast tracts of land and their Court was as grand as any of the royal courts of Europe. In fact they were related by marriage to most of the leading families including the Kings of France, England and Aragon. Raymonda’s father, Count Raymond VI of Toulouse was born October 27 1156. He was a son of Raymond V and Constance of France. His maternal grandfather was King Louis VI of France and his maternal uncles included Louis VII of France. He succeeded his father as Count of Toulouse in 1194. He was an enlightened ruler of Toulouse who upheld civic freedoms, allowed exemptions from taxation and protected communal property from the clutches of the church. A cultured man and an accomplished poet, he preferred diplomacy and peace to war but was always ready to defend his ancestral rights and territories. Even though the Counts of Toulouse enjoyed great prestige within the Roman Church, the liberal Raymond VI tolerated the Cathars, a Christian religious sect that appeared in the Languedoc region of France and other parts of Europe in the 11th century and spread throughout southern France in the 12th and 13th centuries. The Cathars believed in two gods. One was Rex Mundi (King of the World) who represented evil and chaos. The other god, the one they worshipped, represented purity, order, peace and love. Not surprisingly the sect was hated by the Roman Catholic establishment, something the Cathars had in common with the troubadours. 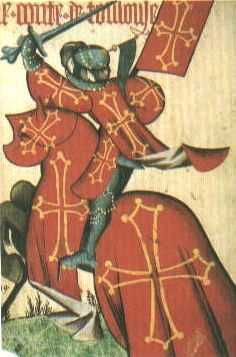 Matters came to a head in the Languedoc on 15 January 1208 when the papal legate Pierre de Castelnau, who was in dispute with Raymond VI, was murdered by a knight in the service of Count Raymond. Pope Innocent III excommunicated Raymond and proclaimed the anti-Cathar Albigensian Crusade. The excommunication was lifted when Raymond VI acceded to the Pope and joined the crusade. The Albigensian Crusade, ruthlessly carried out by knights from northern France and Germany, and the subsequent brutal inquisition, totally eradicated the Cathars. At the same time it substantially reduced the authority of the semi-independent southern Principalities including the once mighty court of Toulouse. Faced with the loss of his territories Raymond VI turned against the crusade and organised a resistance but he was unable to prevent the advance of Simon de Montfort who conquered Toulouse. Excommunicated a second time by the Pope, Raymond was exiled to England. However, with help from his Aragonese allies, he regained the city of Toulouse and withstood a siege by Simon de Montfort who was killed outside the city on June 25th 1218. Raymond, aided by his son and successor, went on to recover most of his territories and he remained in power until his death on August 2, 1222. Though still excommunicated and therefore denied a Catholic burial, shortly before his death he was accepted into the Knights Hospitaller. Now we know what history tells us about Raymonda’s father, but who was her mother? Raymond VI was quite a one for the ladies and in addition to marrying six times had a number of mistresses, which presents us with two possible candidates. The most exciting possibility is Count Raymond’s fourth wife, Joan of England, who he married in October 1197 at Rouen Joan Plantagenet was the seventh child of Henry II of England and his queen consort, the magnificent Eleanor of Aquitaine. Her younger maternal half sisters were Marie de Champagne and Alix of France. She was a younger sister of William IX, Count of Poitiers; Henry the Young King; Matilda, Duchess of Saxony; Richard I of England – Richard the Lionheart; Geoffrey II, Duke of Brittany; Leonora of Aquitaine, and an older sister of John of England. With Raymond VI Count of Toulouse as his father-in-law and Joan of England as his mother-in-law, the social-climbing Jean de Brienne would have been sitting very high up in the royal family trees of France and England. We know that Raymond VI treated Joan none too kindly and she came to fear him and his knights. In 1199, while pregnant with a third child, she fled, eventually arriving at Rouen where she took refuge at the court of her mother Queen Eleanor of Aquitaine. Death in childbirth was common in medieval times and almost certain in cases of caesarean births. Perhaps knowing this was to be her fate Joan asked to be admitted to the great Abbey of Fontrevault where on her deathbed she was veiled as a nun and died undergoing caesarean delivery on 4 September 1199. If indeed Joan of England was Raymonda’s mother it means that we have an exact date for Act 1 of Raymonda, 4 September 1220, her birthday in the year that Jean de Brienne returned from the Crusade. What’s more, it would have been Raymonda’s 21st birthday – not that 21 was such a big deal in the Middle Ages, beyond the fact that one had managed to live that long considering medieval mortality rates. In Languedoc girls came of age much younger. At the age of 14, under the combined Visigothic Law and Roman Law, they were allowed to inherit titles and land and manage it themselves without interference from their husbands or male relations, dispose of their property in legal wills if they had no heirs, and represent themselves and bear witness in court. At the age of 20 they were free to arrange their own marriages. Also, interestingly, Raymonda, Countess de Doris, would be only one year younger that the Countess and Canoness Sibyl. However, contemporary medieval accounts disagree as to the outcome of the birth. Some say that a stillborn child was cut from the dead body of Joan of England, others say that it was a girl who lived, while some say that it was a boy who survived long enough to be baptized and given the name of his Uncle Richard. Disappointingly, on the strength of what little evidence there is, the latter case is the most probable. We do know that Raymond VI had several children by various mistresses and it is more likely that Raymonda was one of these. The Histoire Générale de Languedoc, Tome V, reports “un ancien monument” which records that Raymond VI Comte de Toulouse had a daughter named Raymonde who became a nun at the monastery of Espinasse . She is named and her parentage referred to by Roquebert . A nun at Espinasse, near Fenouillet. And there we have it. The one and only Raymonda in 13th century history spent her life behind the walls of nunnery. No Castle de Doris, no brilliant Court of Love and no marriage to the gallant knight Jean de Brienne. But a question remains. How did Lidiya Pashkova come across this obscure snippet of information revealing the existence of a 13th century Raymonda? Like us, she must have been digging very deep when researching information for her story. And why, out of all the names available did she choose this one? We can only guess. Perhaps she just liked the sound of the name and thought it would make a great title for a ballet – well, for sure she was right about that – or perhaps in a romantic flight of fancy she decided to lift this unknown nun out of obscurity and restore to her the splendid life that she should have enjoyed as a daughter of the illustrious Count Raymond VI of Toulouse. Alas, it was all castles in the air! But let’s not be too hard on Countess Lidiya Alexandrovna. Without her Glazunov would never have composed his glorious music, Petipa would not have given us his wonderful choreography, ballerinas would not have that magical role to dance – would any of them, or us, want to be without Raymonda’s fabulous Hungarian solo – and we would not have this rich tapestry of medieval history come to life before our very eyes.